An experimental version of a Falcon 9 first stage used to test technologies for future reusable versions of that launch vehicle was destroyed during a flight Friday at SpaceX’s Texas test site, the company confirmed Friday evening. The vehicle, known as F9R-Dev, was performing the latest in a series of test flights at the McGregor, Texas, site when the vehicle suffered an unexplained “anomaly,” according to a SpaceX statement issued Friday evening. 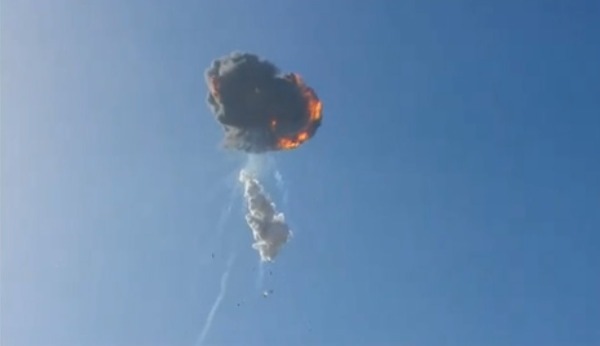 Video of the flight published by local news media showed the stage perhaps tipping too far during a maneuver to translate, or fly sideways, during the test. “During the flight, an anomaly was detected in the vehicle and the flight termination system automatically terminated the mission,” SpaceX said in its statement. Video showed the vehicle exploding, with debris raining down. F9R-Dev was a successor to Grasshopper, the company’s first vertical takeoff and landing testbed. While both vehicles were based on a Falcon 9 first stage, Grasshopper used a single engine and fixed, large landing legs, while F9R had three engines and retractable landing gear. F9R-Dev made its first flight from McGregor in April, and flew most recently in June, according to videos released by the company. The loss of the vehicle is a setback to SpaceX’s efforts to develop a reusable version of the Falcon 9, an effort which had garnered some successes. Besides the earlier F9R tests in Texas, SpaceX had attempted to “land” Falcon 9 first stages in the ocean on some its launches. The most recent attempt, in last month’s ORBCOMM satellite launch, resulted in the stage successfully touching down on the ocean surface before tipping over. It’s not clear what affect, if any, this failure will have on the next Falcon 9 launch, scheduled for next week from Cape Canaveral. A static test of the rocket’s first stage took place as planned Friday evening and apparently was a success, according to one unofficial report. This upcoming launch, which, like the previous Falcon 9 launch earlier this month, is for AsiaSat, will not perform any reusability tests in order to maximize the payload the rocket can place into orbit. This could be a huge problem for SpaceX. Most of the components for this rocket are common with those used for orbital missions. If a component failed due to a design mistake then all future launches have the potential to fail. I’m sorry, but that comment made no sense whatsoever to anyone who understands engineering, and flight test. It’s very unlikely that the loss was due to a “component” failure, but if it did, it’s also very unlikely that the failure would have caused a launch failure, since what was being tested had nothing to do with launch. The most likely cause was a software issue inthe flight-control system or gimbal authority issue, for vehicle recovery, something that would never arise during ascent or getting to orbit. And now that they understand the issue from the loss, it will be fixed. Every rocket manufacturer has and will have their spectacular failures. Hopefully, SpaceX will quickly identify the glitch and have it rectified. I don’t see this having any serious impact on current orbital launch operations, mainly because this was an old vehicle with many flight cycles under its belt flying on what was supposed to be its final flight. However, I’m surprised that the flight termination ended in an explosion as I’d assume it would just kill the thrust… maybe they vented the remaining propellant too close to an ignition source, such as the engine nozzle or thrust chamber? This test article was DeV1 or grasshopper 2 I believe, not the original one engine grasshopper. A bit more spendy, it had three engines and the new legs, if I remember correctly. I believe that “The most likely cause was a software issue in the flight-control system or gimbal authority issue” to use your words was the most likely cause. That disaster was cause caused by an inherent flaw with the SRB’s. Componentry could be an issue in this failure. Oops, my mistake… it wasn’t the older/original Grasshopper, so it wasn’t that ‘long in the tooth’. However, the design and operational differences with respect to the orbital vehicle are still sufficiently large that I’d be very surprised if this incident had any impact on the next launch. The engines looked like they were working fine. From what I saw on the video, the vehicle started to pitch over, like on a ballistic trajectory. I guess they really pushed its buttons with this test. As I told my wife this morning upon hearing the news, I’m glad about this development. It’s been a long time since SpaceX has lost a vehicle, and I’d much rather they lose a test prototype as opposed to a live mission with a paying customer. They blew it up for safety reasons on purpose. It did not blow up on it’s own. That’s why NASA requires them to carry explosives on launches for them. As I already noted, flight termination is usually related to thrust and typically involves shutting down the engines. Only solids require an explosive device stop them thrusting, which is what happened on Challenger, because liquids can normally be shut-down by simply closing a valve(s). This is why I think the explosion here was an unexpected secondary effect of the flight termination, most likely due to due to propellant being dumped too close to an ignition source… something I’ve witnessed first-hand. BTW, anybody pointing to the word automatically and questioning my reading comprehension doesn’t understand software. This was a new 3 engine configuration F9R. I’ve not heard of this before. Why are they going with 3 engines now? Was the single engine not enough thrust or what? Any way this is not a big deal. Break them eggs!! F9 uses three engines for the initial reentry burn, then one engine for landing (as I recall). It would make sense for F9R to have three engines if they planned to do high altitude, high speed tests, as they previous said they would. Which is why they planned to do later flights in New Mexico, since they are limited in how high they can fly from Mcgregor. Not absolutely certain of this, but my best guess is that, with sufficient fuel on board to leave enough remaining to simulate what the residual fuel level would be on a real re-entry, a single-engined Grasshopper 2 vehicle probably either couldn’t get itself off the ground or couldn’t reach the high altitudes SpaceX is cleared to test at in New Mexico. Three engines preserves balanced thrust and gives enough performance to get the vehicle up high fast enough to make these planned high-altitude tests possible. Better this happen during testing than a “live” mission with client cargo and or people. Space X will I’m sure regroup, assess, learn, implement change, (if needed)and move on to push the envelope elsewhere. I love rocket science! Fortunately this accident happened when SpaceX wasn’t launching a billion dollar military payload. For pity’s sake, it’s a TEST vehicle. They’re pushing the limits in their program a la Shotwell. This is why you run a test program, to see what breaks. Test like you fly, fly like you test is well known. Just ’cause no one else is testing like SpaceX doesn’t mean there’s any inherent problems with their design. Historically, the first few launches of a new vehicle are the most likely to break. SpaceX has had basically 2 new vehicles: F9v1.0 and F9v1.1, both of which have performed exceptionally well. There’s no basic issues with any of their design, manufacturing or operations. They would have shown up by now. There has been the odd off-spec item resolved before flight which is also pretty typical of launch vehicles. For info’, there’s been a delay on the next F9 flight of one day just to be sure that what happened is unrelated to their operational vehicles. SpaceX have a conservative approach to their business, pretty much like others. So far they haven’t screwed up like Soyuz and ESA resently did.